Many clients build their website, decide on their social media channels and started posting content believing ‘I’ve built it, the customers will come’. They don’t realise that once you promote yourself, you need to capture interest and potential customers so you can communicate directly with them. Email marketing allows you collate and build your potential and existing customer database, which is extremely valuable if you want to build relationships with clients and drive sales. It’s an excellent way to keep in touch with customers interested in what you do through newsletter information, news and updates which showcase your expertise, and provide a way to sell your products directly. When someone signs up to your email not only do they become a warm lead but they give you their permission to send them what you are offering them. However in order for the activity to work, targeting is key! If you simply buy a list and blast out irrelevant content, you will just be considered spam and be deleted – the activity is therefore rendered pointless. However by attracting the right customers and using effective content email marketing success is yours. Ask your current clients sign up to your list and let them know you’ll be contacting them with interesting and valuable information to help and advise them. Likewise with anyone you have been directly in contact with but who are not yet ready to buy, see if they would like to sign up. This will ensure you stay top of mind and build a relationship with them up until the time they need your product or service. Collect details from those you meet at networking events – every time you meet a new person or potential client, let them know they can find out more about what you offer and learn something of value if you add their details to your newsletter list. Or follow up with them after the event with a link to sign up to your list. Facebook – online email marketing tools like Mailchimp allow you to easily integrate a sign up form into your Facebook page. When sharing a post to get people to sign up you can send them to this specific tab so people can sign up from within Facebook. Popup boxes & slide in forms – make it relevant and also use tactfully. There are options to show after some time, when scrolling or show on exit. Header and footer bars – you can choose to always show or the option for the user to close it. Insert into content – insert a sign up form in the middle or at the end of your content such as blog posts. Widgets – insert an email sign up box into the sidebar or footer of your website. It is best to keep the number of fields they have to fill out to a minimum, email only is recommended, however you could also take first name as well so you can personalise emails. Also often referred to as a lead magnet and is something that you use in order to generate more leads for your business and your mailing list. Essentially what you’re doing is offering something that your audience would find valuable, but in order to access they’ll have to sign up to your mailing list. The best way of doing this is to create a landing page on your website where in order to receive the offer such as a downloadable e-book, printables or information, the customer must input their email address. You can also do this in a more simple way using Mailchimp and adding a link to the content in the confirmation or welcome email. A content upgrade can work really well too as its specific and relevant. For example, if someone is reading your blogs, the chances are they’re very interested in what you have to say on the topic. The key then is to offer them something that is directly related to the topic they’re reading about. So the sign up is to receive something specific rather than just sign up to mailing list. In order to attend the webinars or podcasts, potential clients must sign up to access them and you can collect their email addresses. If you are sharing public content only for example your blog posts, then visitors can already see all your blog content without subscribing. There is not much incentive for them to then sign up to your mailing lists unless of course they just like to be reminded that a new post has come out, as they may not remember to visit your blog all the time. Be sure to provide a link to the sign up page in your email signature offering helpful tips and advice delivered directly. You can also include a link in your signature if you are commenting or guest blogging. When people see you are providing helpful and valuable advice they can click on your signature to view your website and blog. Encourage other people to refer you and recommend to their friends that they sign up to receive information directly. You could even set up some kind of incentive / referral prize if they do. By creating and growing your email marketing list you create a direct connection with potential and existing customers and a highly valuable asset within your marketing toolkit. I have worked with Hugh at Red Cap Sales Coaching for a couple of years now and we chat regularly over Zoom (similar to Skype but better). He is SO knowledgeable and not just in sales .. we discuss business strategies, scripting content, lead generation tactics and more … and his coaching has helped to massively improve my business! He is also one of the nicest people you will meet and has become a great friend and I hope to one day welcome him on a visit to the lovely city of Norwich in Norfolk! Hugh Liddle is THE Sales Wizard at Red Cap Sales Coaching and Elite Sales Academy, where you can learn to make selling easy, fun and profitable. His clients typically double their sales and income in 90 days or less, guaranteed! Hugh’s sales training and coaching comes from over 45 years of in-the-field sales and sales management experience, so you get real life experience from his teaching, not just something out of a textbook. Hugh is the author of Take the Icky and Scary Out of Sales, which you can buy here. He’s also a radio talk show host – take a look at some of the episode on Sales Chalk Talk. When Hugh isn’t teaching salespeople, he’s home in Sebring, Florida with his wife, Priscilla, Jasmine the dog and Mooch and Minnie the cats. He has 6 children, 12 grandchildren and 2 great grandchildren. He plays guitar and bass, sings, writes music and records it. He also enjoys reading and watching Shark Tank on Saturday mornings. We are really grateful to Hugh for sharing with us some of the tactics he has used to grow his email list and generate business. A highly visible button on my website home page that takes people to the signup form. Whenever I do a webinar, there’s a checked box on the registration page (I use Constant Contact) that says I’d like to receive Hugh’s FREE blog posts. They have to uncheck the box if they do NOT want to receive the blogs. If they leave the box checked, I’m now allowed to add them to my list and email to them without it being considered spam. Anytime I meet someone and get their business card, I ask them if they are on social media, and if so whether we can connect there. I also ask if they’d like to receive my free blog posts. If they say yes, I simply write LI, FB, TW and or Blog on the back of their card and add them to the list when I get back to the office. NOTE: In most cases, if you connect with someone on LinkedIn, you have access to their e-mail address, and since you are connected, you have permission to contact them! There is a SUBSCRIBE button on every blog I write, so even if someone reads the blog on my website, or someone forwards a blog to them and they aren’t already subscribed, they can easily sign up. And of course, I wouldn’t be practicing what I preach if I didn’t tell you that you can go to http://bit.ly/wizard-blog and get have my free blogs delivered directly to your inbox. You’ll get great tips, ideas and strategies that will help you dramatically increase your sales and your income! 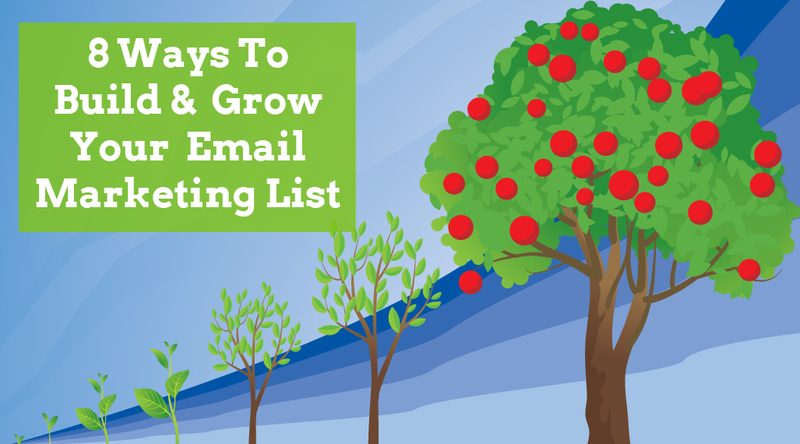 Do You Need Some Help Building Or Growing Your Email List?